Amidst a wave of nostalgia in the late 1980s, an abundance of defining pop and soul nuggets from the 1960s were given new life. Revival concerts and CD reissues of classic LP’s were all the rage. In a sign of true dedication to its most prized of influential acts, Motown continued to consistently unearth rare vault material of Diana Ross & The Supremes into the ‘90s and 2000s, affording decades-long loyalists and new generations the chance to explore a wealth of material which ultimately helped shape the identity of one of the most important acts of modern popular music. With the pack-leaders of today’s youth-driven radio and streaming often bearing no semblance in appreciation for melodies and story lines that previous successors of The Supremes did for decades, it’s on rare occasion that giant corporations now controlling the back catalog of such seminally vital artists will invest in bona fide physical CD reissues meticulously assembled on a musical—as well as visual—level. Thus, Universal Music Enterprises’ continued release of the trio’s beloved ‘60s albums in expanded multi-disc sets is treasure to behold. Previous packages include Meet The Supremes, Where Did Our Love Go, I Hear a Symphony, and The Ultimate Merry Christmas. 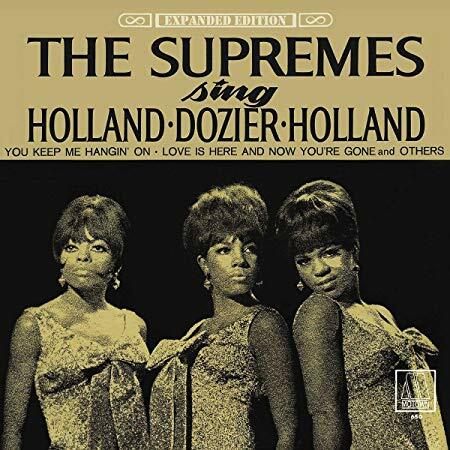 The latest title to be exhumed and broadened is 1967’s The Supremes Sing Holland-Dozier-Holland, the legendary group’s next-to-last to feature original member Florence Ballard before her dismissal by Motown head Berry Gordy, Jr. (and, strikingly, the last to be fully produced by the dynamic songwriting team). Brian Holland, Lamont Dozier, and Eddie Holland were the masterminds behind all of The Supremes’ earlier massive hits such as “Stop! In the Name of Love,” “You Can’t Hurry Love,” “My World Is Empty Without You,” and “Baby Love.” Thus, it’s fitting (notably, during an era in which songwriters were given more recognition—and credit) that they shared the title of Florence, Diana, and Mary’s tenth studio album. The Supremes Sing H-D-H opens with the ladies’ eighth number-one pop (fifth #1 R&B) single, “You Keep Me Hangin’ On,” a defining moment in the careers of the group both in style and timelessness. One of the most covered Motown songs, its boldly funky top-40 arrangement and then cutting-edge vocal production established firmly that The Supremes were not simply sweet pop princesses who occasionally dabbled in soul territory. Although not as omnipresent in pop culture, the follow-up #1 pop/R&B entry, “Love Is Here and Now You’re Gone,” rings vibrantly 50 years later as one of their most emotively distinctive, seamlessly produced singles. Diana emanates each line of heartache with keen affirmation, and the “ghost” backing harmonies of The Andantes compliment her ingeniously alongside the gently billowing orchestra. Although no further singles were released from the album, the original remaining ten tracks are anything but filler repertoire. Especially endearing is the swingin’ “Mother You, Smother You,” a sort of low-key adaptation, musically speaking, of “You Can’t Hurry Love” with melodic shades of “Baby Love.” Flo and Mary’s coaxing background vox complement Diana’s coy yet affirmative conveyance of a nurturing love. The motivating “There’s No Stopping Us Now” chugs along with compositional elements which bring to mind “I Hear a Symphony” and the musical swagger of “Where Did Our Love Go,” but with a decidedly self-assured stance of weathering tumultous circumstances in a romance despite external obstacles. A few stellar selections of the 1967 Copa set (not to be confused with the group’s 1965 show at the same venue, released as the album The Supremes At the Copa) include a hits medley (in which “My World Is Empty Without You” is particularly effervescent); a lightly jazzy take on Jody Miller’s ’65 country hit “Queen of the House”—featuring further competitive banter between Di and Flo; a pleasantly pared-down tooling of “I Hear a Symphony”; and a rollicking romp through “The Happening,” the group’s tenth #1 pop hit (and final single release with Flo still on board). The expanded reissue of The Supremes Sing Holland-Dozier-Holland comes in an eight-panel case housing two booklets. One is a near-replica of the group’s 1967 tour souvenir book, permeated with dozens of candid and action photos of the girls; the second contains an informative new interview with Lamont Dozier about the origins and sessions behind each album track, as well a detailed, eight-page timeline of the period surrounding the recordings and eight further pages brimming with session dates and concert notes. It’s a thorough supplement to the CD’s that one can devour for hours while listening to the two and a half hours’ worth of music contained within. This thoughtful and insightful presentation is nonpareil in the current marketplace, but it’s carried out for the most deserving of legendary acts and music. Recommended.